Since I have stepped our Dubai office as a BDM for my company Techugo- a top mobile app development company in Dubai, I generally get to hear the regular complaints from my co-workers telling me the uncomfort and the uneasiness they can feel in their health system, but due to lack of time they usually postpone their doctor’s visit till next week off days, which at times, does not prove healthy and only prolong the issue further to be originated in a bigger health issue. It is a harsh fact that the demanding lifestyle has drowned us to a level where we enjoy the luxuries of life while compromising our health system, I sometimes envy our previous generation for leading a healthy lifestyle, but at the same time feel pity for our upcoming generation too, who would bear the all environment threats, where the innovation would be at larger extent, but the health would be missing. There is nothing that we want to give an intentional miss to our health system, but there are limitations arisen by our lifestyle which leave us with no option but to carry on with our health issues. Technology has blessed us with great options to track our health system by pressing a few buttons only, and has brought some of the most beautiful inventions in our lives, where we can monitor our different health issues from our home only, but the need of getting the specialist’s advice always remain there, for which we have to make a visit to our healthcare specialists, but which keeps on getting delayed…Do you wonder why it usually occurs? The most obvious reason is, lack of time, and even if the patient takes out the time from the daily schedule, the never ending queues even in the private hospitals consume the maximum time, making it further challenging for the patients spend very limited time with their doctors. The relationship between doctors and patients is very special and if technology advancement can invade it peacefully, it can bring further joy. Technology has indeed taken an impressive turn and the relevance cannot be ignored at any cost. One of the most cherished innovations of technology is a mobile app, which has covered almost every section of industry and the healthcare industry is no more an exception. If you have a piece of doubt in your brain that how come a mobile app can help the healthcare industry, then I insist you to just scroll down the page and read further…. Usually when I make a visit to my Dr., I appreciate if I can have some ME time with my doctor, so I can utter out the every single health problem I am facing, and mobile apps do offer that same secured and private mode of communication with the Dr., wherein a patient can share all the required medical reports with the doctor, and the doctor can suggest and talk with the patient through an encrypted secure mode. Many times it happens that we forget to make a visit to our doctor due to any x,y,z reason offered by our professional or personal commitments, which ultimately delays the treatment offered by the health practitioner, to avoid this hassle, mobile app for healthcare comes in picture, allowing the patients to schedule their appointments through the mobile app platform and even set a reminder for their next appointment, so they can make it to their Dr. and receive the required treatment with no further delay. The appointment scheduling is highly effective for the hospital admin staff as well, who has to schedule appointments for the various Dr. empanelled with their hospital, and can find easily which slot is available for which Dr. and doctors can also leave a special request for their available slots to the hospital staff at any point of time. Earlier once the test report came, patients had to stay for hours to get it reviewed by their Dr., but with the interface of mobile apps, patients can ‘share test results’ in no time. These reports Dr. can access from any place and at any point of time, giving them an edge over the earlier system wherein the Doctor’s physical presence was needed to review the report. The healthcare mobile apps let the patient and doctors fill in their personal details without any issue and can update it further if required. This feature creates no room for errors and patients can reach their Dr. from any corner of the world. Most of the times it happens, that patients can’t keep a track over what Dr. suggested & prescribed word-to-word, this creates confusion, but with a mobile app, the recording feature lets the patients to record the communication between the patient and the doctor, this is also useful for the patients who have the hearing disorder and also this feature help the patients, who need language translation, so they can record and listen to the recording and get it translated as per their convenience. Undeniably the number of papers used in the hospitals is really big in numbers, but it is a need and can’t be ignored, but with a healthcare mobile app, we can easily ditch the paper consumption at hospitals. The healthcare mobile allows the patients, hospital staff, doctors and the admin panel to upload, view and write the prescription, report and any other required details for the patients. With a mobile app, it gets highly easier for the hospital staff to manage the patient’s data on one drive, which can be accessed at any point of time. Yes, this one another great aspect of healthcare mobile apps that it saves a bigger chunk of time for patients, doctors and even for the hospital admin staff, where they can save their time with a filter to optimize the usage of mobile app functionalities. Even if your doctor is in the hospital or away, but they can easily access the patients’ report from anywhere at any point of the day. The accessibility is one of the most beneficial aspects of healthcare mobile apps allowing the health care practitioners to reach their patients and vice versa at any point of the day. While I was searching more for the Arab health exhibition, another wonderful healthcare professionals I got to know from American Hospital Dubai and the best part about the hospital is that their healthcare professionals who are equipped with professional degrees and are active members of 4TS conference. I was simply left in awe of the hospital when I got to see the number of highly qualified health professionals from American Hospital Dubai, like Dr. Omar Kamel Hallak, Dr. Khaldoun Taha, and the list is never ending to describe the health care expertise American Hospital Dubai has to offer. I believe after reading this information you would have understood the significance of healthcare mobile apps is making in the healthcare industry. 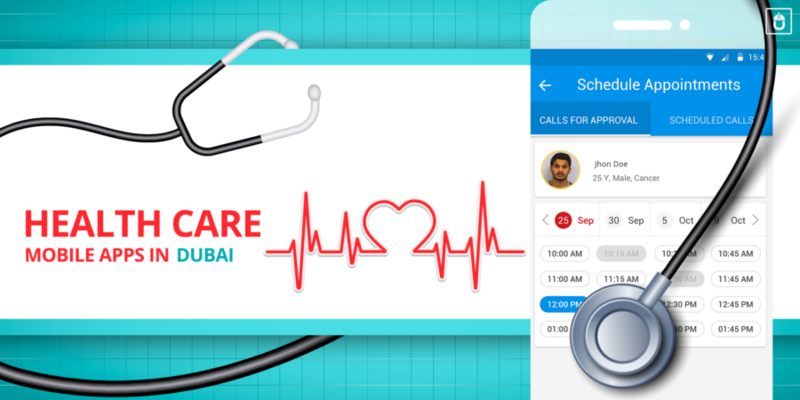 If you think your hospital/ healthcare center/ individual health care business, still lacking the mobile app, don’t wait any further, simply get in touch with Techugo- a top mobile app development company in Dubai, and let us assist you in crafting a masterpiece for your healthcare business.